I was at SHRM, a big city-wide national conference last week. The sessions were great, the key note speakers were fabulous and I feel like it was totally worth my time and (my employer’s) money. However, I am growing old and judgmental so I feel the need to pontificate on some rules of etiquette that made me freakin’ crazy. Show up to the session on time. Being late is disruptive, particularly at a huge conference where the aisle seats are the first to fill up. I had a guy with a vending machine Egg McMuffin behind me. It was loud (as he unwrapped a section at a time) and smelly and when he was finally finished he struggled to jam the wrapper into his empty water bottle for ease of not recycling. That was several minutes of trying to control my blood pressure instead of listening to the session. And don’t get me started on people that can’t drink coffee without slurping. I was in a general session, listening to the keynote, (Malcolm Freakin’ Gladwell!) when three staffers (staffers!) sat in front of me and started texting and chatting. (Texting is fine, as live-tweeting was encouraged, so we were all free to use our phones. Chatting is clearly not.) I nearly confronted them, but they left after 15 or 20 minutes. That was the last time I sat in the general session hall. After that, I found the rooms with the TVs and the bloggers. They also had candy. I realize this one is tough. Sometimes, we just have to pee. And again, sometimes we realize that we chose the wrong session and there are many others available. But out of courtesy to the speaker, please try. Don’t tell me to take notes. I understand you didn’t feel like creating a PowerPoint. Not judging you for that. You told us to print out your five-page handout before coming to the session. Bad luck for those of us that don’t pick our sessions until we arrive onsite. But we are adults and we don’t need you to tell us (over and over throughout the session) what to write down. Are we going to be graded? Is this on the final exam? Overall, SHRM puts together a great program. This was my second year attending and I cram in a whole lot of learning. But the biggest thing I learned? HR people have no better manners than anyone else. The Decline and Fall of Higher Education in the U.S. The Trib wrote about a topic that has been bothering me for a long time – the fact that higher education has become less and less effective every year. Standards are lowering and Google has replaced thinking. The article goes on to interview a college student that claims to have learned very little her freshman year. It was all material she covered in high school. The way I remember it, high school was a recurring refrain of, “If you don’t learn this now, you will never make it through college.” So I guess I believe her. Having gone through the online education experience, I am happy to say that schools are continually looking for ways to reach students and provide different programs to meet different needs. However. That should not be at the expense of teaching. Of holding students accountable for understanding the material and applying it properly. Grades should not be bought. Or begged, cajoled or bullied. I don’t care how much “good money” was paid for a course, it doesn’t buy an A, or even a passing grade. Someone, please. Put our standards back where they belong. I propose every 60-year-old in America gets sent back to college. Maybe not for four years. I’d take one. We’d appreciate the second chance, perhaps even learn something this time around. I am often telling people that whenever you go to college, it is a good thing. If you go at 18, you get it done and get the letters behind your name. If you go at 40, you appreciate it more. And study more, learn more and probably get better grades. Wilson started thinking about it during farewell parties for the college-bound freshmen. I think about it every year when the campus gear hits Bed Bath & Beyond. Who cares about the kids when there are so many new space-saving ways to store your shoes? Except that when I was in college, I had maybe three pairs. The point is, kids, every part of the college experience is a privilege and if Wilson’s Bill passed, I would absolutely go back. But I might skip the dorms next time. In just a couple weeks, students will be heading back to school. Share with us what that means in your life. Are you currently shopping for school supplies for the students in your life? Are you planning on going back to school? Maybe everyone around you is rushing to get ready for the new school year, but you can sit back and relax. Tell us what that’s like. Extra Credit: Tell us what you liked the most and disliked the most about the first day of school! I don’t have kids and I finished what I expect was my final degree program last January. I am sitting for a certification exam in December, though. So perhaps I should get moving. I have already bought my books and a new notebook. Back to School also means new clothes – which I have been buying. And Pumpkin Spice and Apple Cider. And football. Football! And being able to get a table at Noodle’s at lunchtime. At work, it means things are gearing up. Every year, Tuesday after Labor Day, a whole bunch of us fly to our next convention location for a pre-conference planning meeting. It is funny that for some people, the Labor Day vacation is the end of summer and for me it is the trip after the holiday weekend that does it. My nephew is starting kindergarten on Monday. He doesn’t seem to see the milestone. He’s “been to school before”. He doesn’t understand that every year is a fresh start and every class is different. He thinks a clique is the noise that tells him his seat belt is buckled. I am not one of those people that wants a do-over. I feel like I did my time, thank you very much. But still. There is just the smallest little piece of my soul that envies him. Excuse me while I go kill it. Oh, hell. So I went to into my library to look for it. It took awhile because it was still wrapped up – in a book cover way, with the actual English assignment – “supposing that our district was facing the prospect of having Catcher in the Rye banned…” There appear to be Diet Coke stains on the piece of paper – which also have my name and the title of the book written in purple ink in handwriting that was once mine and the word “pesadia” on the back in pink ink, in handwriting that I don’t quite recognize. Kris used to write in pink, though. What does “pesadia” mean, anyway? Cursory Google search gave me nothing. 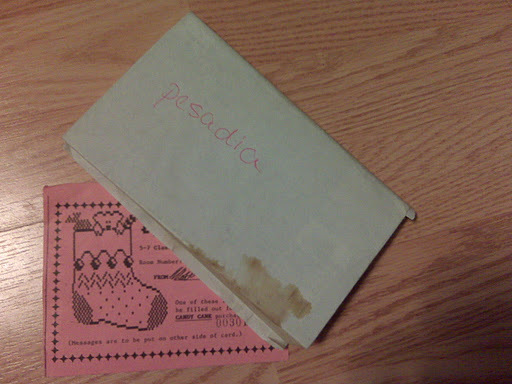 Also in the pages was a little card that came with the candy cane – my school did a fundraiser every holiday where you could send treats to your friends – from Matt my sophomore year. I won’t even tell you what he wrote, but it was vulgar. I do not have dog-eared pages, underlining or notes in the margins. I couldn’t say that this book changed my life on any conscious level. But around that time – the half-way point of my sophomore year – was when I started to like being in a classroom again. When I stopped hating the world and started to get over myself. If I had to be there I might as well learn something, right? How many teenagers do you know whose rebellion was substantially over before they even turned 16? Anyway. I ought to toss that old, damaged thing in the trash and get a nice new copy, but I won’t. The consensus of opinion among my classmates is that we don’t. Have lives, I mean. My job didn’t really suffer. I made some accommodations in my travel schedule, and I asked to be reimbursed for Internet access when I was charged for it on the road. And sometimes it was my excuse for being cranky. Oh, and that week after my final I was logged on to the Student Link all day because I was worried about my grade. My volunteering did suffer. Particularly during my travel-heavy times, I didn’t feel like I could give another night a week to volunteering when I was in the middle of papers and group projects and exam weeks. My family time took a hit. I haven’t spent a real random Saturday with my nephew since the summer. My time with friends took the biggest hit. I remember telling my friend Noah back in August that I’d see him New Years’ Eve. This turned out to be accurate. I think. I really don’t know how people with spouses and children do it. Except that most people don’t have the luxury of choosing school instead of work. We need the employer to help with the tuition expenses. The story begins a couple of semesters ago, on the “Water Cooler” discussion board of whatever class I was taking at the time. It was your basic “here’s what to expect in your next class” discussion. Marketing is the most reading. E-Commerce is just crazy. (Note: It was not. E-Commerce was taught less from a textbook and more from online experience. As well it should. And that made some people crazy. I thought it was the best course in the program.) Corporate Finance was murder. Specifically, the final exam was murder. The way I remember it, the posting student said that in his class the raw average on the final exam was 40%. That was not a typo. 40%. And only the magical curve saved everyone. I remember dismissing the statistic, thinking that even if such a problem existed at one point, it must have been corrected by now. Corporate Finance had been revamped since then, so the final exam must have been addressed. So I wander in to Corporate Finance, my final course in the program. I am a B+/A- student and I have learned my way around the program. I go through my coursework and am holding a 91% average going in to the final. The only thing we are not allowed to do is access other Internet sites. Or MS Excel. It was the worst exam I have ever taken in my life. Twelve years of public education. SATs and ACTs. Two professional certification programs. Four years as an undergrad; two years in graduate school. Worst. Exam. Ever. At the end, when I was searching for a Eureka! moment, I realized that even if I had that moment, I would not have time to rework all of the problems to apply it. I actually gave up. To make a long story short (too late). I got a D on that final. The curve brought my final grade to a B, so I passed the course and get to graduate. I am told that Corporate Finance is no longer a required class in my program.